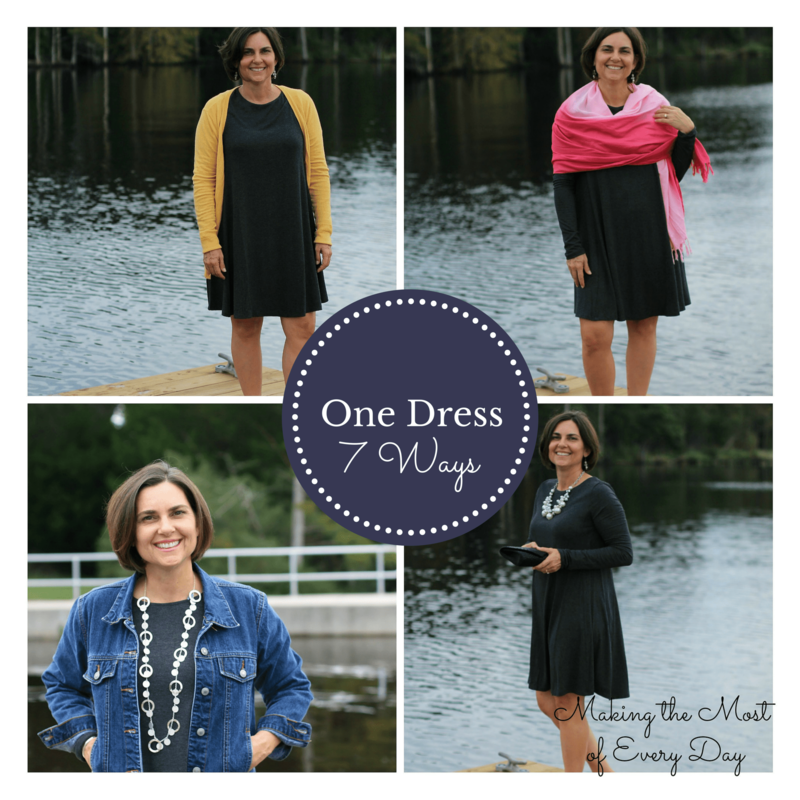 We are on day 7 of the Old Navy swing dress! 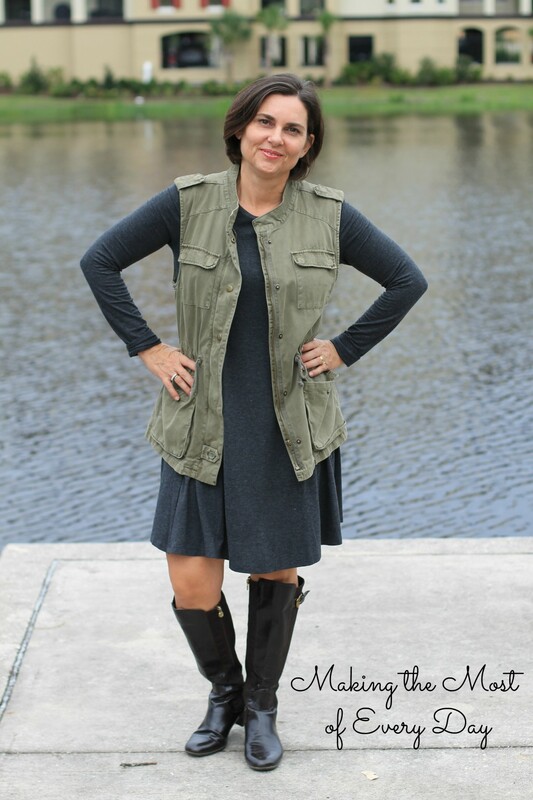 Can you believe how versatile this dress is? I mentioned that you could wear the dress with a denim vest. I don’t have a denim vest but I styled it with my military vest and I like it! I admit that the olive drab and grey together is a little drab. If I wore this I would definitely add some color – either a necklace, a bright scarf or a red handbag. I like how the drawstring gives the waist some definition. It has the added bonus of having pockets so you have a place to keep your phone, lipstick and keys! I wanted to try it with my riding boots but you could also try combat boots or even flats. 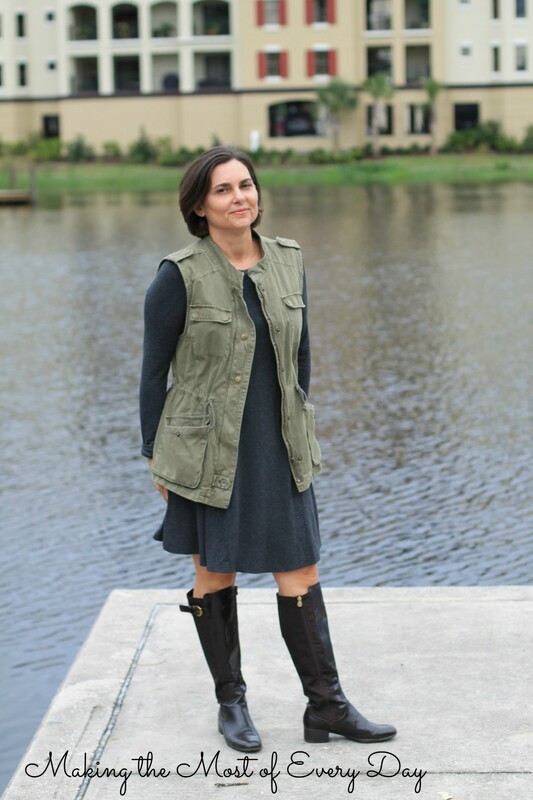 I would also try the dress with different kinds of vests such as a quilted or knit vest. I have a long red knit one that I think would look great but all my vests are still up in the attic. I need to change out my wardrobe soon as it’s finally cooling off a tad. This wraps up the swing dress looks. By changing out the elements with different fabrics and colors, you can totally change up the whole look! Come back tomorrow to see what I’m going to be styling next. Thanks for stopping by! To see all 7 looks you can go back to the landing page here. Oooooo, love the addition of the tall boots! 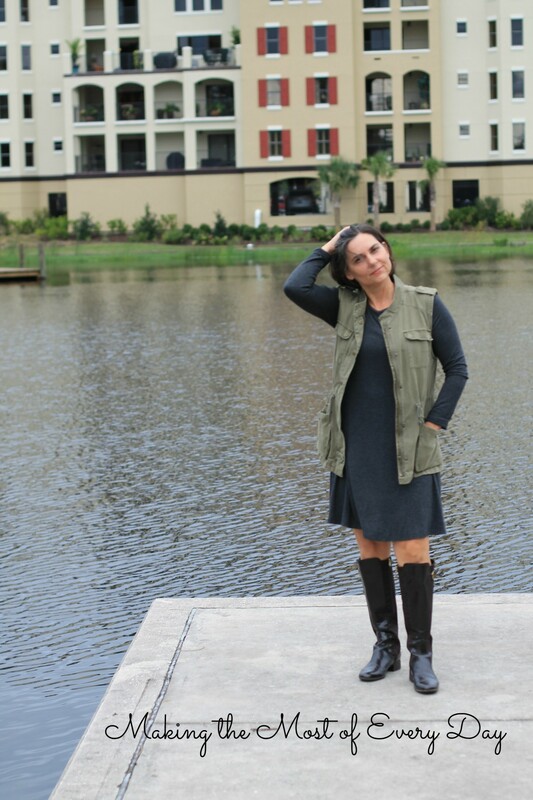 Yes, the tall boots + leggins + layers will make this dress wearable into the winter. In Florida mind you. Not a Canadian winter. OMG, love this! I have that dress too! Although yours is a bit longer. I wanted to try and get it in a bigger size, but couldn’t find it. I haven’t taken off the tags yet, perhaps i should try to find a bigger size…Love everything! Did you get the Old Navy one? I have one in regular and one in petite. The petite one is definitely shorter! The one in these pix is the regular. It’s a medium. Thanks for stopping by Sarah! You have knocked it out of the park with this swing dress! I’m about ready to add one to my closet after seeing all your ideas! 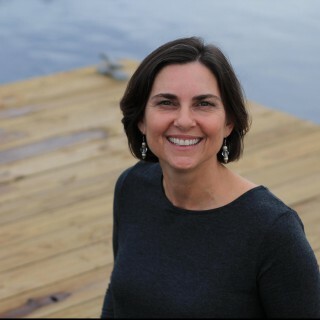 Way to go, Sheila! Hurry! A friend tried to order one yesterday and they are going FAST! Way to add some elements of fun to this great swing dress! Thanks Leslie! It’s really a very versatile dress!